Woodstock Beach Camp i Cat Ba Island, Vietnam: Reservér nu! Woodstock Beach Camp is a unique place to stay. 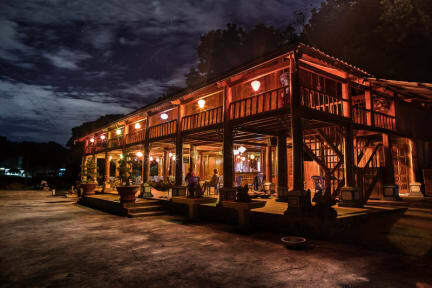 It’s located 8.5km outside of Cat Ba town in a remote bay with a private beach. Across the road is our Wooden House with the reception and a large chillout area. We have hammocks and couches to relax, as well big wooden tables to sit at. It’s a crazy place and we are a team full of artists and musicians. We love to create and bring out our passion. As the place is called “Woodstock”, we love music and love to play it. Express yourself and experience what we call Home. We are not a 5* Hotel and we also don’t want to be one. We are located on an island, so you will be able to see a cockroach or spider once in a while. We have hammocks on the beach to enjoy our view around the bay. The reception side closes at 8pm and the bar at the beach will open. We have big speakers and microphones, electric guitar, acoustic guitar, base guitar and a drum kit, so if you are a musician, you are welcome to do what you love. We run open mics, live music, fire shows, pub quiz, game nights and as well movie nights on our projector in the Wooden House. Ask our staff for inside tips what to do on this island, for example the secret beach or bunker. We run festivals every two weeks with live music, big bonfire, fireshow and DJ with psytrance beats until sunrise. It will be big and loud, and an incredible night to remember. You can book tours and busses with us. We have scooters, kayaks and bicycles for rental, as well laundry service and a free shuttle everyday to town and back. We have a menu with meat, veggie and vegan options, served from 7:30am-8pm. You can join our traditional family dinner everyday at 6:30pm with loads of different vietnamese style food, cooked by our vietnamese staff. We recyle and you are welcome to join our recycling art projects. Enjoy our happy hour deals at the bar. Stay 5 nights and get the 6th one for free. Stay at Woodstock and be part of our family, which includes puppys, dogs, kittens and cats. Lovely place! The people there (guests as well as staff) are super friendly and the atmosphere is so nice. I’ll definitely be back. We had 2 nights at woodstock and i must say my low expectation (because of the cheap price) was not met by far. The vietnamese staff is clearly mad about their job and shouting around being annoyed at the guests all the time. The place is awfully dirty - actually u might find it disgusting. Wasps everywhere and tables are soaked in leftover sauces or whatever it was. We stayed in tents and that was not proper cleaned either - bed linen were not changed and the pillow was full of hair. I had a palm tree in my dorm going up through the ceiling and letting in thousands of mosquitos. There was also rats in my room, climbing up and down the palm tree, and the staff didn't even care. They were so unhelpful and honestly seemed stoned most of the time. They didn't change the sheets either when people checked out and everything was so overpriced. I wouldn't recommend this place to anyone.